“Sit on the floor,” my therapist said. I looked at her skeptically. Had she lost her marbles? But she was patiently waiting for me to do as I was told, so I slowly skootched off the couch and onto the carpet. She handed me a long piece of rope and told me to make a boundary around myself, illustrating my own personal space. Without thinking too hard, I hugged my knees tightly into my chest and made myself as small as possible before circling the rope as close to my body as I could. Wow, this was a very telling exercise! Clearly, I didn’t have any boundaries. The reality was right there in front of me—or around me—and I couldn’t deny it any longer. I’m hardly alone here. Most of us don’t know how to set boundaries. We’re taught to put others ahead of ourselves. (This is especially true for women, but there are plenty of men who have the same issue.) At a workshop, Cheryl Richardson once said something that stuck with me: “If I spend my life pleasing people, I spend my life.” Up until that point, I definitely had been spending my life. As I explain in my book, Jump...And Your Life Will Appear, I was just about bankrupt when I finally woke up. Not everyone puts others ahead of themselves, of course, and some of us are more prone to people-pleasing than others. But the attachment many of us feel to keeping others happy is pretty tenacious. In a certain way, pleasing becomes our currency—the way we purchase love and attention. If we don’t think we inherently deserve love, we feel we must find some way to earn it. As children, we learn to respond in a way that brings us the least stress and trouble, and that often means allowing ourselves to be moved by others’ wants and needs. But as adults, we have to learn to get past our ingrained fears and make clear choices. Most of us have an inner dialogue that tells us we’re not enough, that we’re not lovable. Refusing to set healthy boundaries is one of the primary ways we express that belief. If we want to live fulfilled lives, however, we have to let go of the belief that the needs and opinions of others are more important or valid than our own. We have to stop taking it personally when someone disagrees with us. We have to stop believing that if we disagree with someone or ask for what we want, we’ll end up alone and unloved. 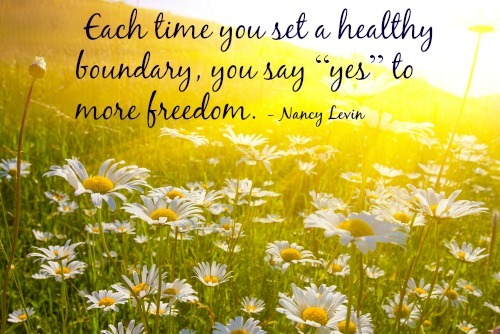 As you begin to set boundaries, remember that each time you set a healthy boundary, you say “yes” to more freedom. Take a deep breath, and commit once again to having the courage to jump into your future. This exercise will help you start small and begin acting from a clean, clear place. 1. Make a list of what you want, but don’t yet have, in different areas of your life. Make sure to include work life, home life, relationships, health, finances, spiritual path, and any other areas that are important to you. 2. Make a list of what you will never tolerate again in your life. For me, this list included my husband’s threats and demands, as well as my own need to overachieve. 3. How would you like to strengthen boundaries in various areas of your life? •I want to strengthen my boundaries around health by ___________. •I want to strengthen my boundaries around finances by ___________. •I want to strengthen my boundaries around relationships by ___________. •I want to strengthen my boundaries around fun by ___________. •I want to strengthen my boundaries around ________ by ___________. 4. Choose three of these boundaries that you are willing to set in different areas of your life this week. Commit to making these changes. In some cases, you might have to declare your boundary to someone else, such as “I’m not going to pick you up from work every day.” In other cases, you may just take a different action to set your boundary. 5. If you worry about someone else’s reaction to a boundary you have set, speak in your mind to the person’s higher self, requesting understanding, reason, and compassion. Then, offer the same to this individual when you declare your boundary. If you can remain calm, it will be easier for the other person to stay calm, too. Practice what you will say in the mirror or to a trusted friend, if necessary, in order to keep your composure. 6. If you need to set a boundary with an adult who is very dependent upon you, visualization can help. After one of my presentations, a woman came up to me and said that she would never be able to leave her husband because he can’t live without her. He may believe that, but his belief doesn’t make it true. If you need to set a boundary with an adult who is very dependent upon you, try visualizing that you have an invisible thread connecting your solar plexus (the flat area in the center of your torso, between your bottom ribs) with the solar plexus of this person. Imagine what it would be like to cut that thread, and visualize placing your loved one in the arms of his/her higher self. Is it frightening? Do you feel like you’re abandoning him/her? If you have an attachment to someone else that is dysfunctional, this exercise is a way that you can begin to disengage from that attachment so that both of you can grow into the independent people you’re meant to be. To learn more about setting boundaries and increasing your self-love, see my book, Jump...And Your Life Will Appear.